The Foundation of the Hellenic World is a privately funded, non-profit cultural institution based in Athens, Greece. The Foundation's mission is to preserve and disseminate historical memory and traditions, as well as the realisation of the universal extent of Hellenism, and the projection of its contribution in the development of civilisation. In order to materialize these objectives, the Foundation has created an innovative Cultural Centre, as well as an extensive virtual presence, on the Internet and through a series of three-dimensional virtual reconstructions of ancient sites. 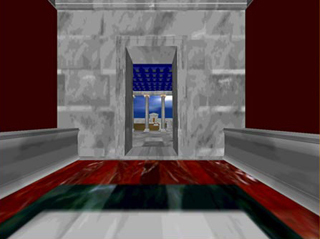 Among the earliest completed projects (in 1999) were the computer reconstruction of Ancient Miletus and the VRML walkthrough of the Theater at the Asklepieion at Epidaurus (images of which are shown below). Miletus over the existing ruins. The reconstruction of Ancient Miletus and other sites are being presented using immersive virtual reality technology that is open to the public at "Hellenic Cosmos", the Foundation's Cultural Center. 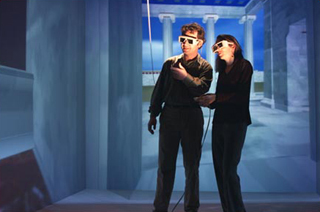 The centerpiece attraction of the Cultural Center is the Kivotos (ancient Greek for wooden chest), a spectacular virtual reality environment in which visitors actively participate in the journey by wearing stereoscopic 3D glasses and using a magic "wand". The Kivotos is an entire room of 3 by 3 by 3 metres, where the walls as well as the floor are projection screens. This setup, together with one of the world's most advanced 3D projection systems, make visitors feel as if they are actually in the picture. 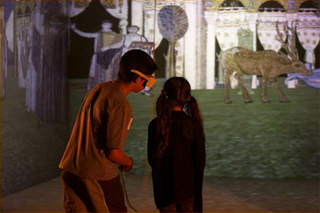 On the "Magic Screen", a smaller virtual reality installation shaped like a table, visitors can engage in similar interactive activities and explore the virtual environment as they wish, not as mere onlookers but as active participants. The premiere programme in the Kivotos, A Journey through Ancient Miletus, propels visitors on a voyage of discovery to the city of Miletus as it was two thousand years ago. 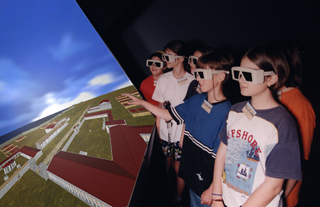 Participants can "walk" through or "fly over" the accurate three-dimensional reconstruction of the most important public buildings or "dive" into the harbour of ancient Miletus!! The Magical World of Byzantine Costume is the first of a series of educational virtual reality programmes related to the exhibition on Hellenic costume currently on view at "Hellenic Cosmos". It brings to life the magical world of Byzantine costume through an experiential educational world created for children. 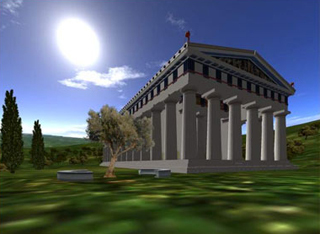 This virtual reality experience highlights the splendour of the temple of Zeus enabling the visitor to experience the famous statue of Zeus, one of the Seven Wonders of the World, of which nothing remains today. 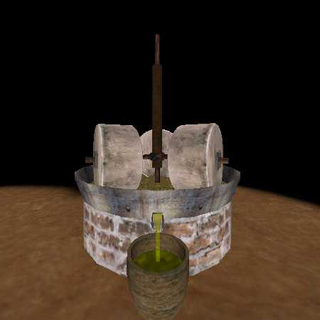 Young visitors can learn about the olive oil production process of the past by actively interacting with a reconstructed olive oil press. This virtual reality programme complements the exhibition on the olive tree and its role in the development of Mediterranean culture. Dimitris Efraimoglou - Head, Systems & Interactive Applications Sector. Vanguelis Christodoulou - 3D Graphics & Animation Department. Maria Roussou - Head, Virtual Reality Department. © 1998-2000 Learning Sites, Inc.